We have had a busy couple of weeks presenting four high-impact scenario-based school safety seminars sponsored by Navigate Prepared. Last week, we presented at two seminars in Cincinnati and Chicago followed by seminars in Pittsburgh and Philadelphia. The seminars consisted of a dynamic three – hour interactive session using more than thirty audio and video school crisis scenarios. 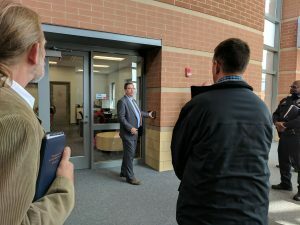 After a lunch provided by Navigate Prepared, each group was split into two groups with one group participating in a walk-through of the facility to discuss ways to enhance safety, security, school climate and emergency preparedness while the second group participated in an interactive discussion and demonstration of the Navigate Prepared system. After one hour, the two groups switched places and the process repeated. We had excellent feedback on this approach at a Navigate Prepared event in Ohio last year and the feedback was very positive for all four of this year’s seminars. We had excellent participation from school, law enforcement and fire service personnel with an impressive number of school superintendents making time to attend the events. I had the opportunity to see participants from previous projects and to make new acquaintances. I also had the opportunity to spend a good bit of time visiting with Navigate Prepared personnel riding with them between events. Due to the positive feedback, Navigate Prepared is planning a series of similar seminars for the fall and I am looking forward to these events. As we appreciate the opportunity to spread our messages of school safety to so many people through these seminars, the Safe Havens International team is scripting, recording and editing a dozen new school audio crisis scenarios for use by Navigate Prepared and their clients as a free value-added service. These should be finished in the next week or so and we are excited to see Navigate Prepared make them available to school and public safety officials. In 35 years working in the field, I have never seen a tool that is more effective in helping school officials train, practice and evaluate their plans, procedures and technology solutions as the scenarios we have been developing over the past decade. I feel honored to be able to work with the Navigate Prepared team and the many impressive people I had the opportunity to meet in this four-city tour. I am looking forward to the next multi-state tour in the fall.